Foreign investors in Vietnam are realizing increasing profitable opportunities because of steady regulatory reform and the gradual expansion of market access to previously restricted sectors. While the market may be opening, many foreign investors still find it challenging to establish their operations effectively in Vietnam. Those who are ill prepared to act upon regulatory updates, revisions to investment restrictions, or other changes to Vietnam’s investment environment can quickly find the setup and expansion process to be an overwhelming experience. Regulatory changes, and the complexity of Vietnamese bureaucracy are challenges, but foreign investors can significantly reduce their headaches by selecting a corporate structure that is well suited to their business plans and keeping abreast of the latest regulatory changes. Foreign investors that understand corporate structuring options – along with their purpose, benefits, and future outlook – make a critical first step toward managing market selection and entry challenges. 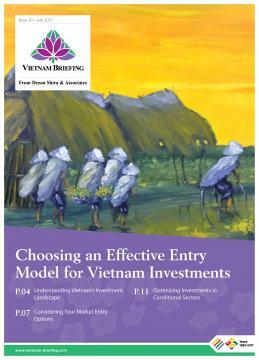 In this issue of Vietnam Briefing, we detail the structure of Vietnam’s investment landscape and outline of the most prudent market entry models for foreign enterprises seeking to take advantage of ongoing reforms. We highlight opportunities for 100 percent foreign owned investment projects, discuss the utility of representative offices in pursuing market expansion, and showcase the role that joint ventures can play in maximizing access to restricted sectors.